I like to pack light when I can for my bootcamp sessions so rather then bringing something for everyone, I like to split the group up and use a double trouble circuit like below. Get into groups of 3 people. Each group has one person facing the finish line while the other two are facing away from the finish line. All three people have their arms linked together. Each group of three people line up side by side at a starting line. The finish line can be anywhere from 20 yards to 100 yards away. On the coaches “Go!”, each groups center person, with arms still linked, runs or lunges to the finish line as quickly as possible. Split the group into two even groups. One group will start on circuit 1 the other will start on circuit 2. Spend 7 minutes completing AMRAP on each circuit, then take a 2 minute break and swap circuits. Repeat so that each group does both circuits a total of two times. Circuit 1 – to be completed with a tyre (or DB or KB), clients should carry the tyre from station to station. Perform 15 reps on each. 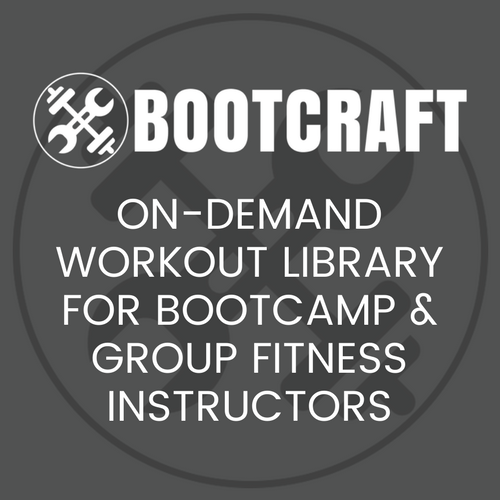 Circuit 2 – Bodyweight. Perform 20 reps on each. If you want to add a competitive edge, add up each team’s number of rounds. Note: On the second round to increase the intensity I lessened the reps to 10 for both circuits 1 and 2.